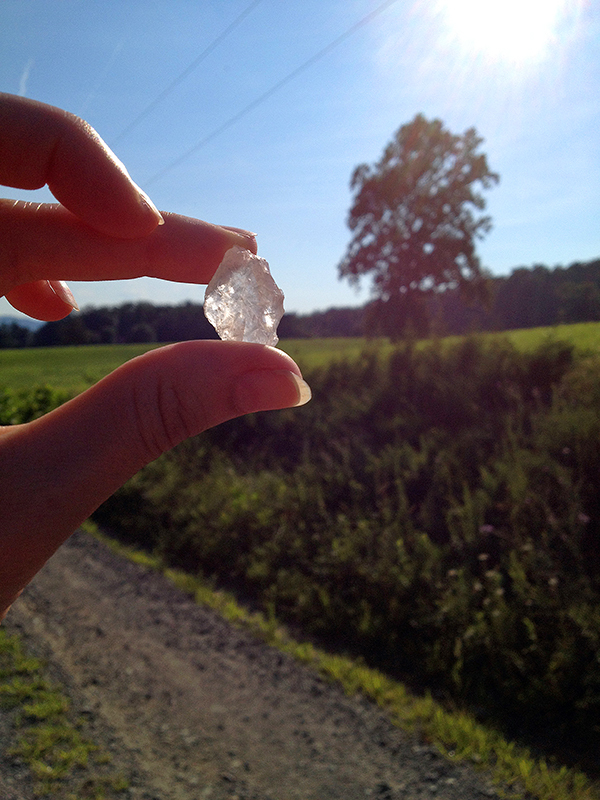 It was a perfect holiday weekend at the farm—unseasonably cool and dry, crystal-clear with a great brisk breeze thanks to Hurricane Arthur. I had the windows open all weekend, the A.C. off, and did a double-take Saturday night when the temperature outside was 52 degrees right before bed. It had been a fun night—from about nine to ten I enjoyed the sounds of the Crozet fireworks show. Despite being fifteen miles away, it sounded like it was in my backyard. Sound has a funny way of bouncing up and down this valley, and it was cool to stand in the yard and hear the blasts echo off each mountain top. 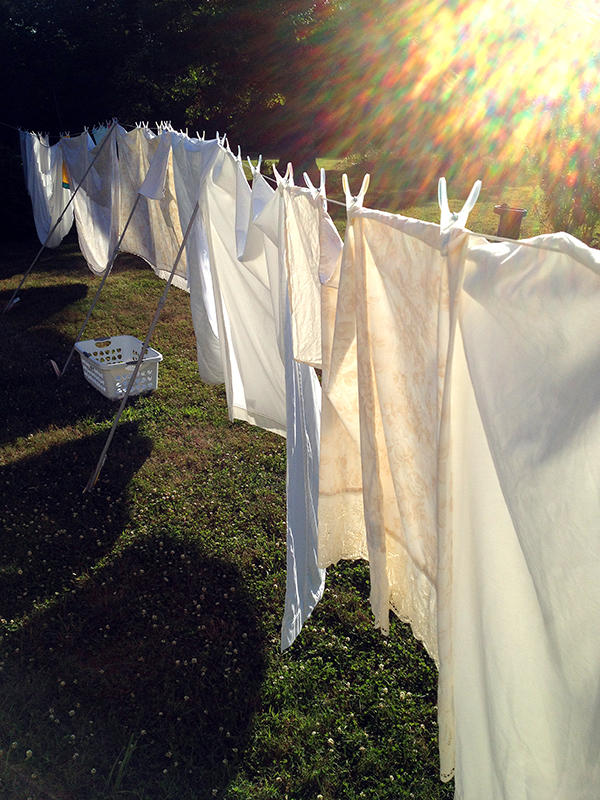 I took advantage of the weather to dry some clean sheets outside on my new clothesline, which I love as it’s relaxing to watch whatever’s hung on it billow in the breeze. Then I parked myself on the back porch for two days straight to soak up the amazing weather before the more seasonal heat and humidity returns again today. 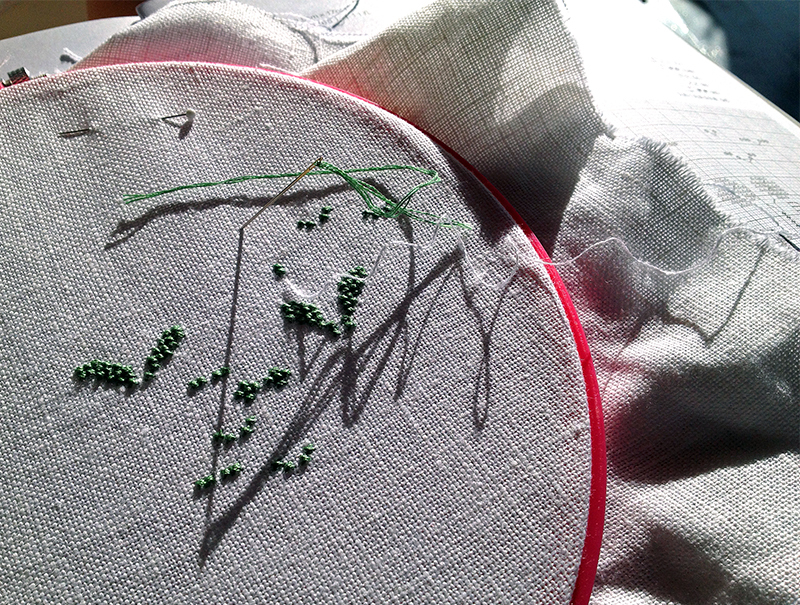 I ate all my meals outside, caught up on my magazines, began re-reading some Faulkner, and started in on this little cross-stitch of green seedlings. The designer is Japanese artist Kazuko Aoki, and the pattern book (Wildflower Garden) I have is a Chinese translation. So it’s been a bit of a crap-shoot to figure out but I think I got it. I had about given up on sewing when I failed to finish a project begun in high school, but I like these simple, spare and natural designs so much that they tempted me back in. I am pleased that I found this sewing easy and relaxing, so much so that I completed the whole project in two days! Spending hours on end sitting on the porch really provided me with a secret window into the workings of all the neighborhood bird life. It’s amazing what you can see if you just. don’t. move. 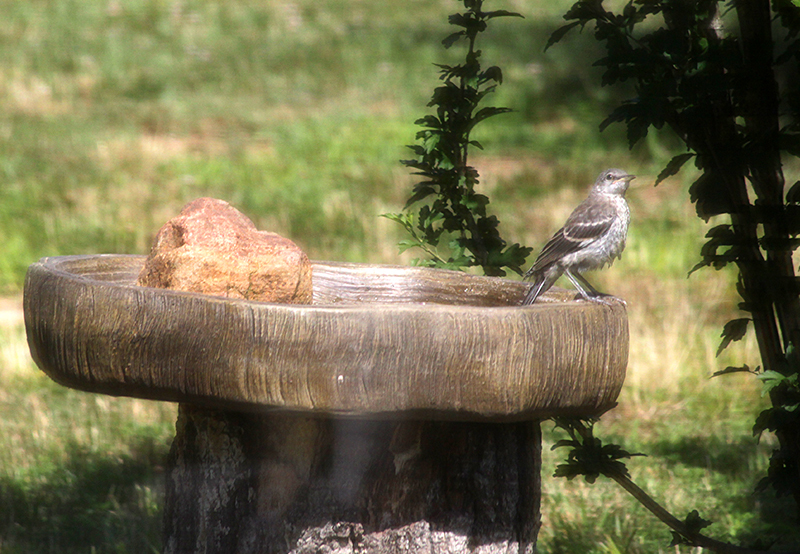 I caught the baby mockingbird’s discovery of the bird bath, and watched as it figured out how to toss water over its wings. 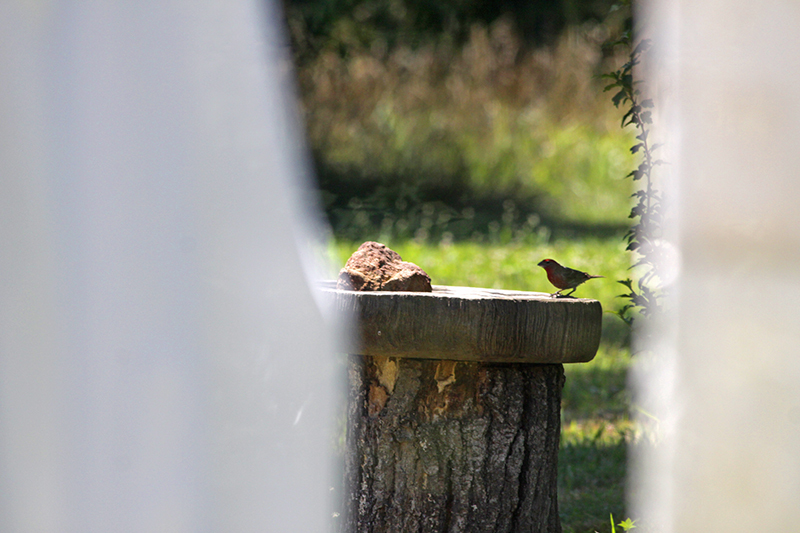 I am convinced that the birdbath, which I added last year, is behind the notable uptick in the number of breeding birds in the yard. I was going to shim it up to make it more level, but watching this fledgling explore the water made me realize that the birds probably appreciate the beach-like effect of a slightly off-level bird bath. It’s a zero-depth entry kiddie pool! Then yesterday in early afternoon I heard dramatic, insistent bird cries from somewhere near my head. 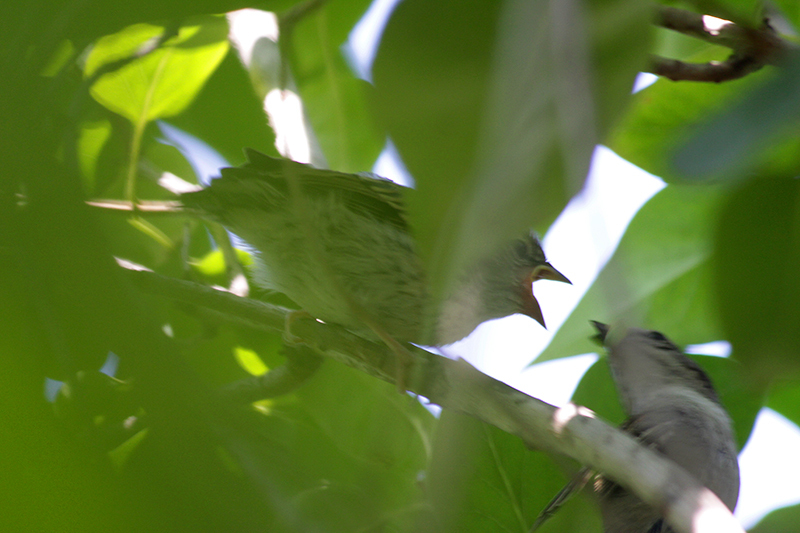 I poked around following the sound and discovered a sparrow fledgling in the big lilac, begging for food. 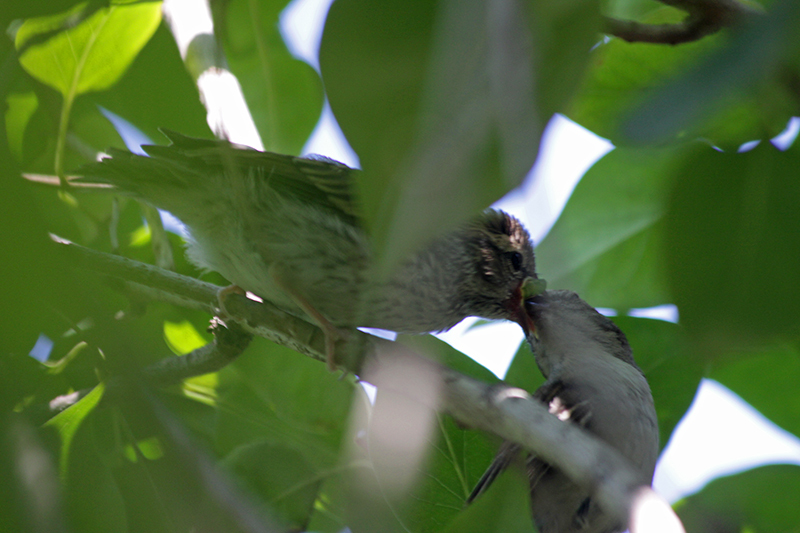 I got this shot of its parent stuffing a fat green worm beak-deep into its loud child’s mouth. The temperature had begun to creep up yesterday evening, and by 5:00 p.m. the sun was too much on the porch. 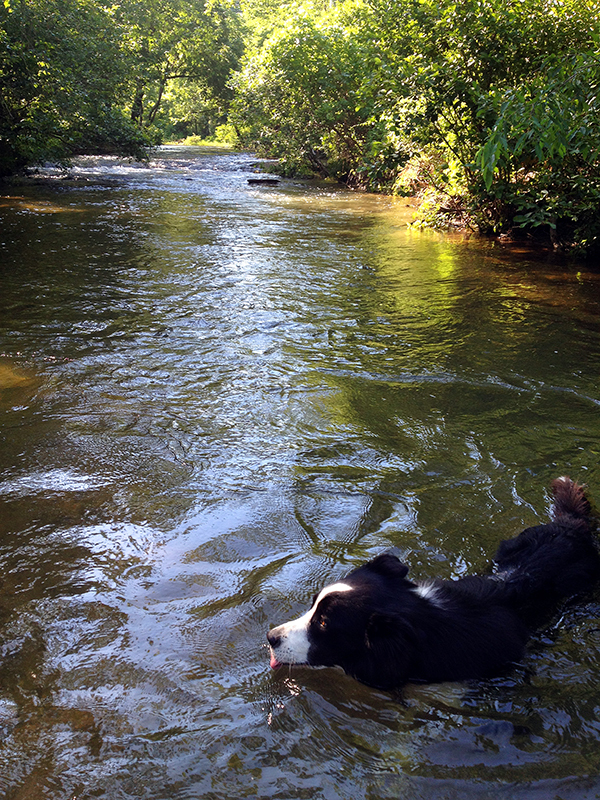 So Tuck and I hit the road for our usual three-mile loop to a nearby river, where we could cool our paws in the slow-moving water. And then home, walking in the sun along a hot and dusty gravel road between verges full of warm and fragrant yarrow. It smelled dry and sweet, like the desert, or, I imagine, the Mediterranean. It was the perfect end to this gift of a summer weekend. You are currently reading Between the sheets at Bonafide Farm.